What do you think of the plans for Crimdon? Mail readers have expressed their support for plans to bring a new cafe to Crimdon beach. The proposals, if approved, would also see new toilets and a volunteer centre created in the area. If approved, the new facilities a Crimdon would be paid for with cash from the Government's Coastal Communities Fund. An application for the plans is being submitted to the Government's Coastal Communities Fund by Durham County Council. The local authority is asking for £1.5million from the fund. Improvements to Crimdon are part of wider plans to overhaul the Durham Heritage Coast - and building work could start later this year if the proposals are given the go ahead. We asked you for your views on Facebook, and many of you said the new buildings would be a welcome addition to the area, and improve the coastline. Others expressed concerns about the impact any building work could have on wildlife in the area, and if the new facilities would lead to an increase in letter. 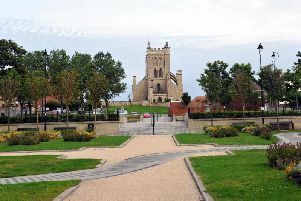 Sally Hart: "I like Crimdon, great look out with the kids and the dog. It'll be lovely to have a little cafe." Daniel Steetley: "Crimdon has lots of visitors now, used to have a big car park and a cafe. The open space there was supposed to encourage nature, it hasn't. A visitors centre with ample parking will bring more people to the beach and Dene. But they also need to ensure the impact of these visitors on the beach and Dene is properly managed." Gren Long: "More people mean more litter and dog muck. That will also need to be managed." Ian Hudspith: "There used to be one there called the Pavillion. My Gran worked there. It closed due to lack of visitors and nothing's different now." Stephen Lilley: "Spot on, get it done." Andi Turner: "I hope so, it's beautiful." Andrea Squires: "Providing none of this will in any way have a negative impact on the nesting site of the Little Tern then it’s a great idea. They could look at making a play area on the land near the riding school or even the entrance to the Dene which would theoretically keep people away from the nesting site." Kay Blackett: "Be nice to have bird hides there for the twitchers and a cafe, just like Saltholme. There was a little place selling teas built into the cliffs in the 60s, be nice to see that resurrected." Cats Elaine: "Yes that would be lovely, especially if they have nice toilet facilities too." Stephen Picton: "I go for walks along there. I said a few weeks ago could just sit and have a cuppa. If the heritage fund has money then let them have it. Keep prices low on cafe and people will come. High prices will scare them off." Sarah Peckett: "It would be lovely to have it developed. Would benefit so many people from dog walkers, tourists and neighbouring riders." Lynne Pennington: "Always used to be somewhere you could get a cuppa. Brilliant news." Laura Small: "We love Crimdon. It's our favourite beach as it's so quiet and clean. My only problem with this is I don't want this lovely area to turn into Seaton which is always over crowded and littered with rubbish." Karen Gregory: "It would be fab to have facilities at Crimdon again."